Go the extra miles from town and you get more for your money, plus some peace and quiet. Ad Book now! Rates from US$11++. Average rating 7.8 from 100 reviews. Vesper Homestay is located 1.5 kilometres north of the old town, on the way to An Bang. It’s a family home with five rooms and the friendly family provides a warm welcome. Flashpackers can look forward to startlingly clean, minimalist modern rooms. The deluxe room is fab: spacious, white walls, large windows you can open and with its own cute, narrow balcony veiled by greenery. It also comes with a vanity/desk, flatscreen TV, fan, comfortable bed, clean linens and large wetroom bathroom with hot water. Superior rooms are on the small side, perfect for one but tight for two. If cleanliness, comfort or quiet are your main concern, it’s worth the eight-minute cycle to town. 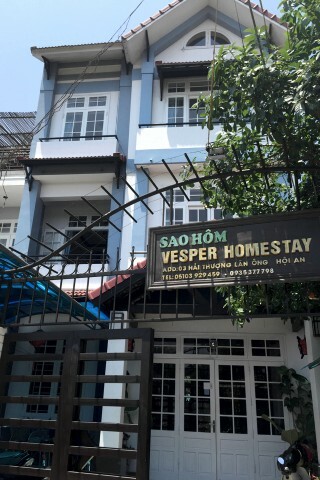 There’s an explosion of accommodation labelled "homestay" in Hoi An these days, but few places really endeavour to make you feel welcome like the family at Vesper. Guests stay in a local lane so this would be an ideal spot for weary travellers looking for a bit of hospitality and quiet location. Party animals look elsewhere. Vesper is easy to find. Continue north on Phan Dinh Phung until you reach a dead end, which is a block north of Ly Thai To Street. The paved road ends and you turn right down the dirt path. While there has been some new development around it, Vesper gives you a sliver of rural life. Check rates at Vesper Homestay on Booking.com.